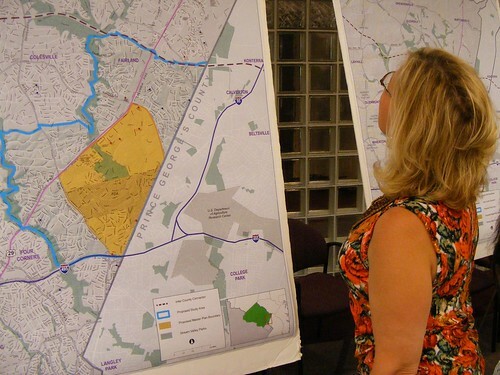 Kate Prager, a Colesville resident of 30 years, said she went to the open house to learn what exactly the master plan is. "It sort of gets me alarmed about more congestion, more building, more taking out trees," she said. But Prager said she has no plans to move, so she's just hoping planners find the right balance of building a thriving mixed-use community while preserving forests and finding a transportation solution. She's the typical person at a lot of community meetings in East County - white, middle-class, and established, with no need to buy a house or find a job. And while her concerns are valid, they're representative of a small silver of the population here. We must bring a wider variety of people into the discussion, or we'll get a community that only reflects the wants and needs of a few. East County residents and businesspeople met with Montgomery County planners last Wednesday at the Regional Services Center to learn about a proposal to bring a life sciences center to White Oak. When completed, the East County Science Center Master Plan will recommend creating a mixed-use community with a focus on science and technology in an approximately 1400-acre area bounded by the Beltway, New Hampshire Avenue, Columbia Pike, Cherry Hill Road and the county line. Kim Bobola from the East County Citizens Advisory Board looks at a map. The goal of the plan, as outlined on its website, is to create a 21st-century vision for the "Cherry Hill/FDA/White Oak area." The main tenets of that vision are a community built around a "bio-tech employment cluster"; a "better jobs/housing balance" in an area with more residents than employment opportunities; creating "more diverse housing options" in the area, and bringing it all together with "efficient transit" and open space. While previous master plans have taken up to 3 1/2 years to draft, staff will finish the plan on an abbreviated schedule at the behest of the County Council, eager to bring more attention to the neglected communities east of Rock Creek Park. "This is a big master plan, and we only have two years," explains project leader Khalid Afzal. Those seeking to build in the area were at the open house, including some of the car dealers located on Cherry Hill Road and Jere Stocks, president of Washington Adventist Hospital, which has land for a new facility on Plum Orchard Drive. Also there were Jonathan Genn and Ayana Lambert, president and general counsel for developer Percontee, who's proposed a large development on Cherry Hill Road called LifeSci Village. "This is exciting because it means something's happening," says Lambert. "It's a step in the right direction." Transportation planner Eric Graze brought a board showing proposed rapid transit routes in the master plan area, including ones along New Hampshire Avenue, Columbia Pike, and Cherry Hill Road. He explains that the map was largely derived from County Councilmember Marc Elrich's county-wide bus rapid transit plan, currently under study. One line crossing the Food and Drug Administration campus between New Hampshire and Cherry Hill was an unknown, however. "I have no idea what that is," Graze says. 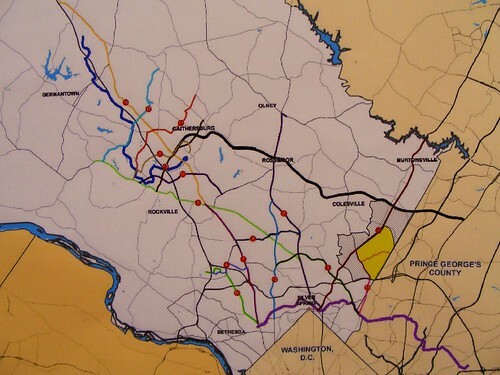 Map of potential BRT routes in Montgomery County. Planners seemed to outnumber residents at the four-hour-long open house, but those who did stop by could write comments on large boards. Their suggestions were heavily favored towards more development in East County. "Allow high density at the existing shopping centers (White Oak & Hillandale)," wrote one commenter. Another advocated a bus rapid transit line down Route 29. Because of the plan's abbreviated schedule, some opportunities for community outreach - like an advisory committee made up of local stakeholders - may not happen. That'll be a big concern in White Oak, where reaching out to tenants of apartment complexes or non-English speakers in the area can be difficult. "We haven't figured out how to get that segment of the population to come out," Afzal says of the area's large immigrant communities. While drafting the sector plan for the Wheaton CBD - now going before the County Council - planners visited the owners of local ethnic shops to get their opinions and ideas. 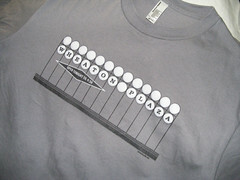 "We went to them" in Wheaton, Afzal notes. "If you don't have time, we'll come to you." As with most land use issues, getting anyone involved is difficult regardless of their background. "There's an entire group of people interested in land use, and another group who won't come no matter how much we reach out to them," Afzal says. "Maybe they think we're doing okay." How many more cars will be added to that already coridor. Talk of mass transit always sounds good but how many people are willing to give up their cars and use it? Do we really need anymore development in Montgomery County? It sounds like a Ponzi scheme. We need more development so we can have more revenue. We need more revenue so we can spend more money. I don't know if you know this, but when we build houses people live in them, and when we build offices people work in them, and when we build shops, people shop in them. It's not like we have all this empty space sitting around because someone got too greedy. The demand is here, and people are coming, and we have to accommodate them. And when the County is suffering from a fiscal crisis, it certainly wouldn't hurt to have more revenue. We have to pay for the roads and the schools somehow. So you like "more congestion, more building, more taking out trees?" Higher density isn't necessarily the answer for upgrading the area. Greater density seem to cost us more in taxes to provide necessary services than the higher density generates in added tax revenue. Plus it tends to reduce quality of life for the residents. That's why people are willing to pay more to live in less dense suburban areas. That certainly doesn't explain why someone would pay upwards of $1 million for a condo in Bethesda. Robert, you do understand that not everyone is like you and may not want to live in a single-family house? And that those people will pay a premium to live in the kind of place they want to live in? I want to have amenities close to where I live. Why should I drive to Bethesda or Rockville or Columbia for shopping, or for work? I'm currently sitting in congestion trying to get to other places. I'd rather have things close to home, where I don't have to drive as much. That's a tool for reducing congestion. It's worth noting that the East County Science Center master plan area currently contains a mix of office parks and industrial uses. The 300-acre LifeSci Village project would take place of a concrete recycling plant. We aren't losing any trees for that. I agree with you, Dan, that it's great for people to live and work and shop in the same place. I live and work in such an area myself. That said, I'm curious. When these high-density developments are built, where do the people who move there come from? From other high-density? Or from more suburban areas? I wonder if there will be a net decrease in congestion in the area... but it's safe to guess that it'll get worse. Who will live here is a good question. Clearly, planners assume some of the soon-to-be 9,000 FDA workers - the same ones who are already snapping up the high-end townhouses going up around East County - will want to live closer to work. I imagine U-Md. students, a fair number of whom commute from this are already, are another target audience. And older couples who raised families in the big single-family homes in the area might downsize to a new apartment or townhouse in the plan area. Will congestion increase? Of course. But you'll have more stuff close to home, meaning you won't be in traffic for long. I think this same discussion was going on back when the NIH was being built and developed in bethesda and what is now downtown bethesda was being discussed, and we all know how that story turned out. 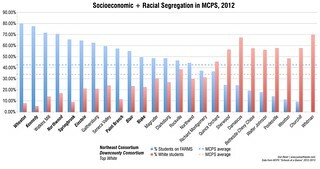 So why not do the same thing in east moco? Would u rather things stay the same and let high quality development continue in western moco/northern virginia?